10 Signs You Could Have a Parasite! Clients return from their work or holiday travels only to find that they don’t feel well. After a detailed assessment, parasites are discovered. Having a parasite can be a scary thought, but you’re not alone; they are far more common than you think. Let’s look at the many ways you can contract a parasite. 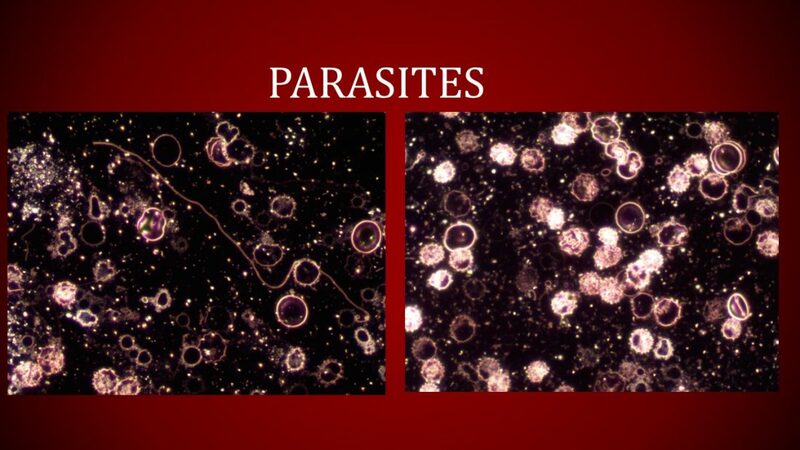 Parasites can enter your body through contaminated food and water. Under cooked meat is a common place for parasites to hide and unclean or contaminated fruits and vegetables can also harbor parasites. Parasites can enter the body by traveling through the bottom of your feet while walking bare foot. When traveling overseas, foreign parasites can be introduced into your system if you drink contaminated water unknowingly. 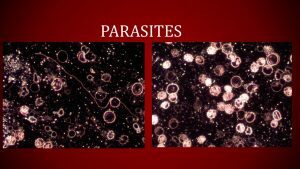 So how do you know you have parasites? In live blood cell microscopy we zoom in to your blood using a high powered microscope. We can see numerous types of issues burdening your body. The most common burden is a type of parasite seen microscopically, environmental worms. Now these parasites can feed off your nutrition leaving you hungry after every meal. Others feed off of your red blood cells, causing anemia, B12 defiencies. Some lay eggs that can cause itching, bloating, pains, irritability, and even insomnia. Let’s just say that they are something you want to deal with sooner rather than later! Especially because it’s very easy to pass them along. If you have a parasite and don’t wash your hands after using the restroom, you can easily pass microscopic parasite eggs onto anything you touch — the door handle, the desk, your phone, or anyone you touch. The signs of a parasite can often appear unrelated and unexplained and that’s why people often go on suffering far longer than they need too! History of food poisoning and your gut has not been the same since. Trouble falling asleep, or you wake up multiple times during the night. Skin irritations or unexplained rashes, hives, rosacea or eczema. Grind your teeth in your sleep. Pain or aching in your muscles or joints. Fatigue, exhaustion, depression, or frequent feelings of apathy. Feeling unsatisfied or full after your meals. Getting tested after travelling to a foreign location is also recommended. If you notice any of the symptoms above and aren’t feeling your best, come on in to figure things out. Balance Point’s Live Blood Technicians will help you explore your blood and get you feeling better fast. Your first visit will be one hour long and you will receive guidance and information on next steps for your overall care.